This issue of Psychiatric Clinics, edited by Drs. 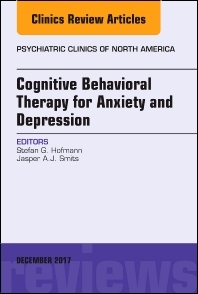 Stefan G. Hofmann and Jasper Smits, will focus on Cognitive Behavioral Therapy for Anxiety and Depression. Topics covered in articles in this issue include, but are not limited to: Basic strategies of CBT; Core mechanisms of CBT; CBT for anxiety and depression in severe mental disorders; Unified treatment for anxiety disorders; Internet-assisted CBT; Cultural adaptions of CBT; Pharmacological enhancements of CBT; and Current status and future directions of CBT. Stefan G. Hofmann is a Professor of Psychology and Director of the Psychotherapy and Emotion Research Laboratory at Boston University. Dr. Hofmann has served as President of the Association for Behavioral and Cognitive Therapies and the International Association for Cognitive Psychotherapy. His research focuses on the mechanism of treatment change, translating discoveries from neuroscience into clinical applications, emotions, and cultural expressions of psychopathology. Professor of Psychology at University of Texas Austin. Federally funded investigator of studies testing the efficacy of behavioral and integrative interventions for anxiety and related disorders, and has published over 150 works, 30 of which have focused on anxiety sensitivity. Dr. Smits is a member of the scientific council of the Anxiety and Depression Association of America and serves as associate editor for Journal of Consulting and Clinical Psychology, Cognitive Therapy and Research, and Journal of Anxiety Disorders. He has edited a number of books, including Anxiety in Health Behaviors and Physical Illness; Handbook of Physical Activity and Mental Health, and the Wiley Handbook of Cognitive Behavioral Therapy.